This bouquet is the picture of elegance and sophistication. The luxurious flowers and soft colours with a lush green backdrop make this flower arrangement truly sensational. Our team of expert florists have carefully selected and combined Memory Lane Roses, White Avalanche Roses, and Belle Roses with Santini Chrysanthemums and Pistacia. We have even included a gorgeous butterfly to emphasise the beauty and theme of this bouquet. 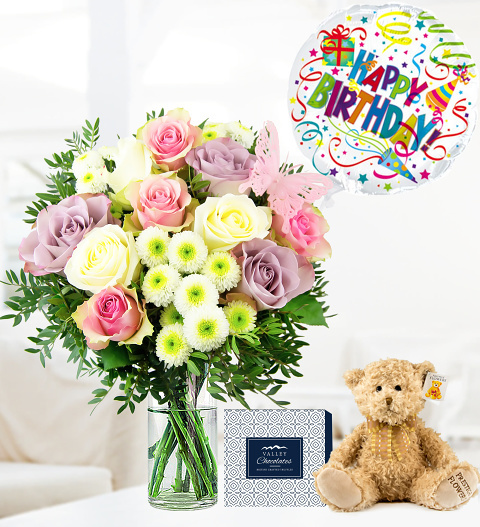 An excellent gift for any occasions including birthdays, anniversaries, and all other celebrations!